Goro Kashiwaeda was second-generation Japanese and a renowned hitter in Hawaii. He had a chance to play for money in Japan, but, instead, he gave his life fighting for the country he loved. Kenneth Goro Kashiwaeda was born on February 12, 1912 at Makaweli, Kauai, in the Hawaiian Islands. An American of Japanese ancestry, Goro was the eldest of a talented baseball-playing family. He starred at third base for Lihue High School and played outfield in Hawaii's amateur leagues. Kashiwaeda was a great power hitter and was one of the few to hit a ball over the right field fence at Makaweli. He was also invited to join Bozo Wakabayashi in Japan to play professional baseball, but WWII put an end to that. With the Japanese attack on Pearl Harbor in December 1941 came an unfavorable view of Americans of Japanese ancestry in Hawaii. Unlike their brothers on the mainland they were not sent to internment camps but were also not allowed to serve their country even though many wanted to fight for the United States. But in March 1943, when a call was made for volunteers for the newly formed 442nd Regimental Combat Team (RCT), Kashiwaeda left his job in the business offices at the Olokele Sugar Company in Makaweli, and entered military service. 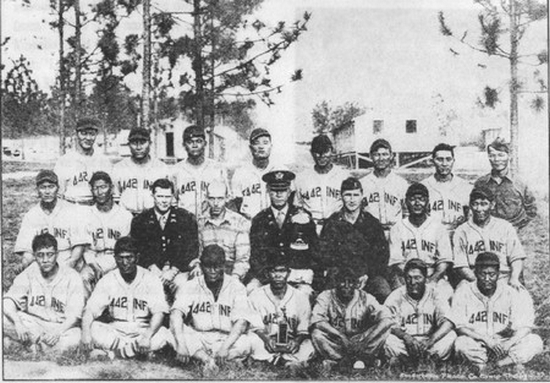 Private First Class Kashiwaeda trained at Camp Shelby, Mississippi with L Company and became a key player on the 442nd baseball team, hitting a game winning home run in the bottom of the ninth inning to bring the team a divisional championship in 1943. That game winning ball remains a treasured keepsake for the Kashiwaeda family. On June 2, 1944, Kashiwaeda and the 442nd RCT disembarked at Naples, Italy. They went in to combat on June 26 near Belvedere. On July 6, Private First Class Kashiwaeda was killed in action near Follonica, Italy. He is buried at the Honolulu Memorial in Hawaii. Excerpts taken from In Freedom’s Cause: A Record of the Men of Hawaii Who Died in the Second World War (1949) with permission from The University of Hawaii Press. Visit www.ajawarvets.org for more information on Americans of Japanese ancestry servicemen. Thanks to Astrid van Erp for help with this biography.